A relative humidity meter, also referred to as a humidity detector or humidity gauge, is a device with a humidity sensor that measures the relative humidity in the air. PCE Instruments offers a number of relative humidity meter products including handheld relative humidity meter, data recording or data logging relative humidity meter, and combination or multifunction relative humidity meter devices that also measure parameters such as room or ambient temperature and atmospheric or barometric pressure. A relative humidity meter can measure relative humidity (RH) as a percentage (%) from 0 to 100 % RH, depending on the humidity measurement range of the specific model. If you have any questions about the relative humidity meter products found on this website, please contact us at or +44 (0) 2380 987 035 for PCE Instruments UK, or at or +1 (561) 320-9162 for PCE Americas Inc. The PCE-HT 71N Relative Humidity Meter detects air temperature and humidity and stores readings in its internal memory. The Relative Humidity Meter has a compact format and a wide memory capacity (up to 32,000 values / 16,000 values for each parameter) and it is mainly used as a data logger in fields such as supermarket refrigeration units, refrigerated transport, warehouses, and other temperature controlled environments. The PCE-HT 71N Relative Humidity Meter detects air temperature and humidity and stores readings to its internal memory. This Relative Humidity Meter is compact and has enough memory to store up to 32,000 readings, 16,000 for each parameter, and is used above all as a Data Logger, in supermarket refrigeration units, refrigerated transport, warehouses and other temperature controlled environments. The PCE-HT 71N Relative Humidity Meter detects air temperature and humidity and stores readings in its internal memory. The Relative Humidity Meter has a compact format and a wide memory capacity (up to 32,000 values / 16,000 values for each parameter) and it is mainly used as a Relative Humidity Meter in fields such as supermarket refrigeration units, refrigerated transport, warehouses, and other temperature controlled environments. The PCE-313A Relative Humidity Meter measures relative humidity and temperature and can be used in the air-conditioning sector. The PCE-313A relative humidity meter can be connected to type K thermo-elements to detect, for instance, the temperature of a wall by means of a surface probe. The internal memory of this test equipment allows the relative humidity meter to record humidity and temperature data at an adjustable measurement interval. Thanks to its SD memory card (1 to 16 GB) the humidity test instrument can be used for long term data acquisition. PCE-HVAC 3 is a multifunction relative humidity meter, tester or diagnostic measuring device used for indoor climate and environmental monitoring. In addition to measuring relative humidity and ambient room / dry-bulb temperature, the meter calculates dew-point and wet-bulb temperatures in degrees Celsius (°C) and Fahrenheit (°F). Thus, heating, ventilation and air conditioning (HVAC) installations and HVAC system performance assessments are key applications of the PCE-HVAC 3 meter. The PCE-FWS 20 Relative Humidity Meter Station is a multi-functional wireless digital device that will exceed your expectations. This manufacturer-calibrated meteorological instrument accurately measures temperature, relative humidity, precipitation, atmospheric pressure, wind speed and wind direction. Featuring a free-standing or wall-mountable touchscreen LED display with backlight, the PCE-FWS 20 makes a fantastic gift. The Relative Humidity Meter combines various functions and sensors in only one instrument: Air Humidity Meter, Wind direction, Wind speed, Temperature meter, rainfall, and data logger. Furthermore, the meteorological station has different alarm functions and settings for the measurement parameters. The measured data can be sent by radio to the base unit (max. distance of 100 m). This test instrument is equipped with the latest technology used in meteorological analysis. The touch screen allows you to recall data onto the screen easily. PCE-VA 20 is a multifunction relative humidity meter for testing heating, ventilation and air conditioning or cooling (HVAC) systems. This combination anemometer-hygrometer-thermometer features a 10 cm / 3.9" Ø fan impeller, easy-to-read backlit LCD, and functions such as display hold, average value, maximum value, minimum value, battery-saving automatic power off, low-battery indicator, and metric or imperial unit selection. The PCE-FWS 20 Relative Humidity Meter is for private and professional use. This meteorological station allows the accurate detection of wind direction, wind speed, temperature, relative humidity and precipitation. The USB port and the included cable allows transmission of data from the device to a computer. Software for analysing data is also included, which enables you to analyse and check meteorological fluctuations, presenting data in graphs and diagrams for measurements over prolonged periods of time. The multifunction relative humidity meter PCE-THA 10 is easy to operate with one hand thanks to its compact size, the new structure and integrated impeller. In addition to the humidity, the relative humidity meter measures the temperature, wind speed, dew point, the wet bulb temperature and the air volume. Average wind speed values can be determined with the relative humidity meter from the 20 preset points. The PCE-VA 20 is a versatile relative humidity meter for determining environmental conditions such as wind, temperature and humidity. It is additionally used to test heating, ventilation and air conditioning / cooling (HVAC) systems. This triple thermometer-hygrometer-anemometer device has a 10 cm / 3.9" Ø fan impeller and a clear backlit LCD. Available functions include display hold, average / maximum / minimum value, auto shutdown, low-battery warning, and metric / imperial choice. The PCE-VA 20-SET is a multi-functional relative humidity meter including flow hoods for assessing and balancing heating, ventilation and air conditioning or cooling (HVAC) installations. This multi-faceted anemometer-thermometer-hygrometer incorporates a 10 cm / 3.9" diam. fan impeller, easy-to-view backlit LCD, and useful functions, e.g. display hold, average val, maximum val, minimum val, auto power-off, low battery indication, and imperial/metric option. The Relative Humidity Meter PCE-TH 5 is a universal temperature / humidity gauge which allows the measurement of both the ambient temperature and the ambient humidity, as well as the determination of the dew point and wet bulb temperature. The Multifunction Relative Humidity Meter PCE-THA 10 is easy to operate with one hand thanks to its compact size, the new structure and integrated impeller. In addition to the wind speed, the Relative Humidity Meter measures the temperature, humidity, dew point, the wet bulb temperature and the air volume. Average values can be determined with the Air Humidity Meter from the 20 preset points. All test instruments are delivered manufacturer calibrated. You can buy ISO certification as an option. The PCE-THB 38 Relative Humidity Meter is ideal for detecting and digitally displaying humidity, temperature and barometric pressure. Temperature is measured by an RTD sensor and air humidity is measured by a highly repeatable, capacitive sensor. 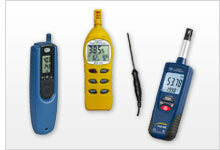 All products are test instruments, and the Relative Humidity Meter is sent out manufacturer calibrated. An ISO certification is available optionally. The Relative Humidity Meter PCE-P18L was developed and constructed for the permanent monitoring of temperature or humidity. The compact dimensions of the relative humidity meter are the characteristics of this instrument. The measurement of the temperature and humidity is via a semiconductor component.